The RPG, as you've probably already figured out, is called Pokemura. It is set in the routes around Fortree City, mostly. This is a free roleplay -- meaning it has no real plot -- but eventually there may be the threat of some kind of natural disaster. In the end, it's up to the members to decide. Brief History: nothing spectacular, but could possibly include family, past battles, etc. Appearance: Renjiro's only distinctive markings are his slightly green-tinged eyes, and a scar that runs down his left arm. Personality: Renjiro's attitude is mostly laid-back and quiet, but if another Pokemon were to stray across his path then he would be sure to greet them -- if they weren't a threat. He is polite, but tries to stay away from his own kind, and is a bit fearful at first to make friends with females due to his past. Renjiro, at times, is easily angered and will flare up immediately, becoming a cold, fierce creature instead of the calm Sceptile he previously was. Brief History: Renjiro was born to Mikio and Maiya, a pair of Sceptile living around the forests. As he grew, he came across a young Grovyle female named Taree, whom he later took as his mate. However, Taree wandered off from their nest one day, and was never found again. Ever since he has been hesitant to make female friends, for he often wonders if they will disappear, too. Last edited by Tetesi on Sun Jul 16, 2006 3:59 pm, edited 1 time in total. Apperance: Roger has four large seeds on his tail instead of the usual three. Oh, and he's shiny. Personality: Roger's almost always looking for a fight to become stronger. However, he'll only fight someone who's worthy, so he doesn't beat up anything that moves. He knows when to kid around and when to be serious, though he's the latter at most times. When he's not fighitng or in the mood to fight, he's pretty laid back, but most of the time, he's in the mood to fight. He does respect Pokemon even if they turn down his challenges, and doesn't just walk up to Pokemon saying "Wanna fight?" though. Other than that, he's pretty normal, with no tramatic expierences that have tainted his mind. Brief History: Even as a Shroomish, his personality was pretty much the same; always wanting to fight, but in this case, to evolve into a Breloom. He grew up in a nice, warm, loving family, with many siblings (he was the oldest). Uh...I'll fill this in a bit more when I come up with more stuff. Appearance: She looks like every other absol only she has a scar running across her right eye. personality: Rayne prefares not tot fight because of her upsetting past.She will fight only when attcked and never when challenged. Rayne spends most of her time in her cave beside fortree city and veiws battles among trainers as entertainment. she takes comfort in being left alone as she is known as a disaster pokemon. Breif history: Rayne was greatly mistreated bye her trainer. 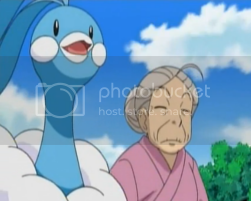 The H.P.F.O (hoenn pokemon freedom orginization) helped free her and send her into the wild. She was rejected by her former clan because of the unatural moves she knew from the tms 18 & 25 that she had been froced to take. Her former trainer was a member of team aqua, this is where her deep hatred and fear of the sea stems from. Emerald leaves glimmered under the light rain shower that fell upon the forests. Millions of tiny splashes were seen below the gaps in the vast, leafy canopy. Underneath a broad leaf, a tall, reptilian creature stood, sighing deeply. The rain would again give water to the trees and the other Pokemon that ruled the woodlands close to Fortree City, and as far as the Sceptile was concerned, it made his job a little bit easier; Renjiro was the self-proclaimed healer of the forest, giving life back to withering saplings and helping flowers bloom again. Renjiro turned his head, the dark pupils in the sea of his lime-yellow eyes narrowing to a suspcious slit. There had been a rustle in the bushes and tall grass that surrounded his nest. "Stupid forest," Roger grumbled to himself. He was in desperate search of his home, a large Watmel Berry tree. It was hard to miss, but roger had traveled too far off from his home searching for food that he was lost. Pushing tree after shrub after bush, he still was unable to find his home. "And now it's starting to rain," he sighed. "Well, this is just fantastic. Guess I'll have to stay here until it clears up," he finished, leaning against a medium sized tree, slowly slumping down until he was sitting down. Appearance: Rais is slightly larger than most Venomoth. Personality: Rais has always had a slight fear of humans from his past. He is very proud and will only battle with those that are worthy of a battle, although quick to temper he is otherwise quite calm and rational. Living quite near to Fortree City he is often the target of trainers wanting to catch him. Brief History: Rais is the only known Venomoth living in Hoenn. He arrived in Hoenn after he stowed away on a ship when he was a Venonat and was captured by a trainer shortly after, he soon found out that his trainer wasn't particulary kind to pokemon and found himself training day and night so he would evolve. One day he was attacked by a group of Mightyena and lost. His trainer abandoned him in Fortree City and he has stayed ever since. Rais sat silently in his nest overlooking Fortree City, the wind causing the tree to sway slightly. Rais watched as several Taillow flew out of the tree of off into the sky. Rais stretched his wings and took off into the air, gliding over the tree tops, scanning the forest floor for something to eat, he suddenly noticed a Sceptile, looking around. Rais hovered in mid-air, curious. Lifting his chin slightly, Renjiro studied the lithe white form of an Absol, who seemed to be the cause of the rain. Smiling slightly, he shifted himself so he backed up a bit more into the dark ferns, wondering if he had been noticed. He had no problem against the Omen Pokemon, but any predatory creature could get him a bit uneasy. A purple moth Pokemon fluttered over the expanse of leaves, before he stopped, observing the Sceptile. Renjiro raised a claw with a nod of his head, saying, "Greetings." His tail -- which resembed the branch of a coniferous tree -- swung slightly, rattling the plants he seated himself by, and disturbing a few insects that flitted away. Rayne looked up through the sparkling leaves of the Oran berry bush to see a Venamoth whom she had noticed many times fluttering above what must have been its nest. Rayne followed this venamoths gaze to the other side of the tree which the bush she was hiding in grew beside. Possibly another pokemon. The rain she had caused was easing off so she uncovered herself from the bush, ate an Oran berry and directed her gaze back to the large Venamoth. She had seen a venamoth before, on her escapades with team aqua. Team aqua was raiding the safari zone in Fuchsia city when they were stopped by a heroic man in a ninja suit. This man was a trainer and had a venamoth. Among the other venamoth in the safari zone this was bigger and more elegant than the others. It used a combination of astounding attacks that defeated Aqua in an instant. This venamoth reminded her greatly of that in kanto. The tree rustled and a voice sounded "Hello" it said. Rayne made her way to the side of the tree where she could see the source of the voice which was a sceptile. After resting for several minutes, Roger chose to continue on, even in the rain. As long as there was no nearby thunder or lightning, he'd be fine. He still was trying to find his home, but he wasn't even sure he was going the right way. Eventually he wondered upon a Venomoth and a Sceptile. After a short moment, he gathered the courage to ask them, "Excuse me, but do any of you know where a large Watmel tree is?" Bemused by the presense of two new Pokemon besides the Venamoth, Renjiro let his gaze sweep across them all, resting on the Breloom, who had asked if he knew the location of a Watmel tree. He chuckled, hiding his uneasiness behind a calm barrier. "What, are you hungry?" he asked. He pointed his claw in the direction of the large tree, trying to be as helpful as usual. He put his arm behind his back and grasped a Grepa berry in his claws before biting into the soft yellow fruit. "What are your names?" he ventured, trying to be friendly. It seemed like the shiny Breloom might have been in a hurry, but the Venomoth and Absol had yet to speak. "Thanks, and I am hungry, but you see, the Watmel tree is my home, and I'm...lost," he sheepishly admitted. "Well, I was, until you told me where to go, thanks. By the way, I'm Roger. What about you?" "Maybe I should just eat here for now, I'm tiring of carrying these. ", he thought, still holding the two Oran berries, the fruits of his search, either Pokemon, trainers, of a combination of the two have picked most of them already. Without thinking he took a bit out of one of the Oran berries. Rais saw the Sceptile raise its claw in greeting before an Absol and a Breloom entered the scene. Rais looked puzzled for a moment. He hadn't really seen any of these pokemon before, well he had seen the Absol a couple of times. Rais swooped down and landed on a tree, leaving a trail of sparkling powder behind him. "I'm Rais" Rais said, grabbing a Pecha Berry from a nearby branch. "What's your name?" Continuing to much on the Grepa, the Sceptile nodded as the Breloom introduced himself as Roger, and then the Venomoth as Rais. "My name is Renjiro," he said, offering each of them a tiny smile. The Absol had not spoken yet, but he ignored her for the most part and concentrated on eating, not minding if he appeared rude doing so. The creamy-tinged white-and-brown shape of a ferret-like creature erupted into view, and the Linoone stopped, skidding and tripping. Renjiro stifled his laughter and grinned in a lopsided fashion. "Well . . . nice to meet you, Line. I'm not exactly sure what everyone's doing." The green creature tilted his head to one side, frowning. "I think I'm eating and talking to you." He lifted the yellow berry again and finished it with a few gulps, humming his contentment. APPEARANCE: Unusually colored, with a black body, teal spikes, and purple eyes, and is a bit smoother than other metang. PERSONALITY: Unbelivably Violent and Rash. Mackey is unbelieveably self-centered and wild. BRIEF HISTORY: Mackey was an unusual creature. He, a few years before, had gotten lost nearby Fortree, and can't find his way out. Thus, he made home in the forest, and has lived off of anything he can find. With no second thought, he will attack, attempt to kill, and eat anything he encounters. "Come on! We're almost there!" Said the man holding the map. "But I'm getting tired! Can't we rest somewhere?" Said the man who had been adressed as Brent. "We can rest when we reach Fortree." Said the last man. Just then, out of some foilage, leaped out a Metang. He bashed the Mapbearer out of the way, and slammed The man who had adressed another man as Brent. Both flinched from the powerful blows the Metang had dealt, and then looked at Brent. "What are you doing!? RUN!" Said the man who used to have the map. The map had now landed on the ground and its ink was beginning to completely wash off. "What... Odd coloration." Said brent, looking at the Metang. The metang just intently stared back. Last edited by A deadly person! Ohno! on Fri Jul 14, 2006 6:32 pm, edited 1 time in total. "Oh. Heh, nice to meet you!" Line said, with a smile. "Talking. Yes." Hmm...why haven't I thought of this before? It's so obvious... Line thought to himself. He wasn't the most clever of the Linoones: in fact, he used to be called "goofy" among his friends, but he didn't really care. He knew he was silly, and haven't heard any complains so far regarding his behaviour. Line watched as Renjiro munched on his Grepa, and felt his stomach twist. He sniffed the air for some seconds and looked up to a tree, to see some juicy Oran berries hanging on the very top of it. "Food!" He shouted, and in a subtle he jumped on the tree, climbing it fastly, snaking on its stalk. The Orans were stick to the very far end of one of the highest branch. He litteraly sticked to the branch, and, trying not to look down, he slowly reached for the two Orans. Quickly putting them in his mouth, he turned around to return to the stalk, but lost his balance and fell. Rais could hear something too. "It sounds like a battle" Rais said, straining to hear. "I'll go check it out"
Rais flapped his wings and rose up above the trees. He saw a column of fire rising up into the air. >>Looks like a Fire Spin attack<< Rais thought. Rais swooped back down into the trees. "It looks like a Fire Spin attack... I could go and take a closer look" Rais suggested, still hovering in the air. Background: His father is a Blastoise, his mother is a Charizard. Because of who his parents are, he has gets picked on a lot so he has learned to fight with a variety of attacks mainly special attacks. Due to this, his physical attacks are weak. "Ooh a battle!" he exclaimed, finishing the first Oran berry. He liked watching battles almost as much as being in them. "How far away is it?" Roger asked Rais. He didn't want to travel too far just to find out that the battle would be over by the time he got there. Appearance: A normal Murkrow with a golden beak. Personality: Mysterious yet fun loving. Has a french DNA part. Getting him into the french rhythm. Brief History: Doesnt see many pokemon, is very French. "Me oh my, A little gathering of pokes. Havent seen others for ages." Murky muttered to himself. "Ah, must greet them, yes, greet them.." He grinned and paced up to a small, long creature like a ferret and a hovering purple butterfly. There was also a tall green thing he'd never ever seen before. Murky hasnt seen many different pokemon before, he's only seen Weedles, Caterpie's and Pidgottos. "G'day to y'all." Murky said with his eyes gleaming at them. "<s>Je m'appelle</s> I call myself Murky." Line looked a bit puzzled. Even though he was a thief, most of the time, his group and himself could easily deal with their thieving without getting involved in a fight. They were very fast, so they always ended up escaping before his foes could react. However, that sounded somehow, interesting. Perhaps, if he witnessed a battle, he would be able to learn a bit, thinking about future plans. Before replying, he looked up to see a Murkrow presenting himself. Still with his mouth full, he introduced. "Name's Line. Nice fo meef ya'"
"Line... Tis an honour." Murky listened out for squabbling noises in the distance. "I heard something about a fight. What is zis?" Murky loved to start fights, but they never got to be bad fights. He'd never seen a big fight. The metang burst right out of the pokeball, and attacked the Combusken with a psychic force. The combusken fainted, and roger returned him to his pokeball. He looked at the metang in shock, as the fiery whirl died down. "That... was my last one!" Brent said, as he backed away into a run. His two other colleagues soon followed him. The metang was alone; he had won. He knew this as he crashed into the dirt below.